Our programs bring people of the world closer to Japan and provide opportunities for cultural empathy, surprise, and discovery. The invitation program takes place in Tokyo and other cities throughout Japan for duration of about 10 days, welcoming young generation and adults from other countries/regions, mostly from Asia and North America. Participants will learn about strengths, allures and values of Japan through various activities, such as observing cutting-edge technologies, visiting historic/scenic sites, observing local industries, and experiencing traditional cultures and pop cultures. 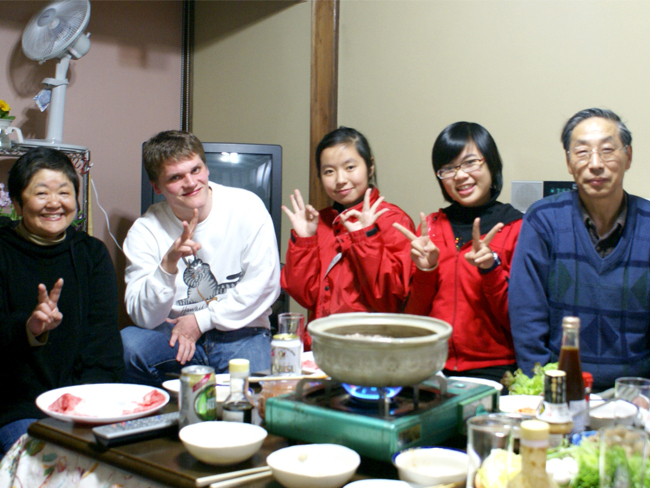 In addition, the participants will intermingle with Japanese citizens in school exchanges and homestay, creating a chance to develop trust and friendship with each other. 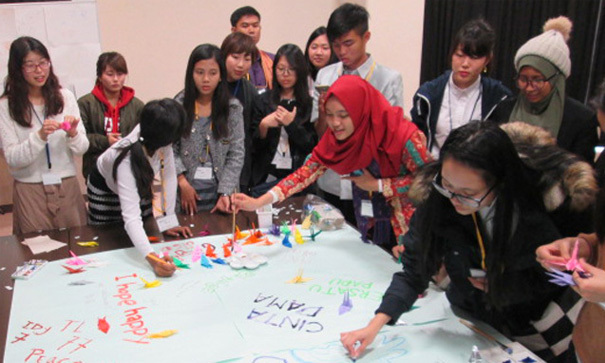 The visit program sends young Japanese generation to other countries/regions to broaden their views to the world. The participants will learn about society, culture, and life style of people living there, as well as introduce about Japan and his/her own town through field trips, school exchanges, and homestay. 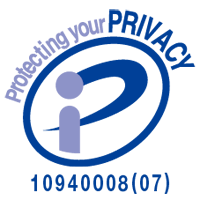 JICE offers fulfilling programs that will meet the participants' needs in careful consideration of the political, economic, social, cultural, ethnic and religious background of each participants. Built on our knowledge and experience as well as strong networks both at home and abroad, we will step up activities that will promote mutual understanding of people from different countries and regions. "Polluted cities can become green cities"
Meeting the green bird and taking part in their volunteer work was a great experience. 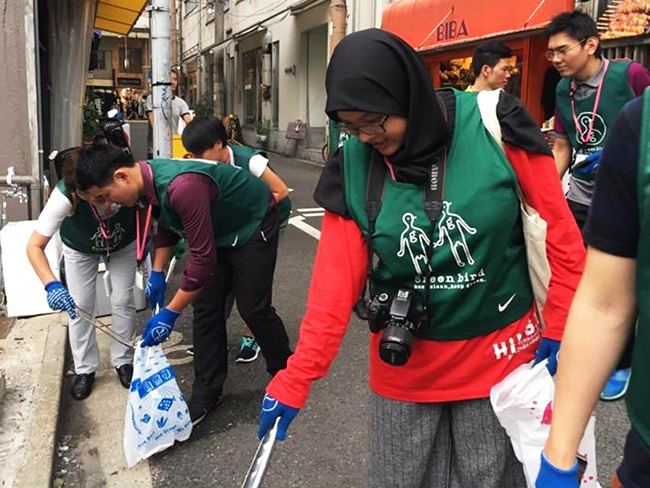 It helped me realize that Japan actually had not only clean places but the volunteers were doing their part to clean the city and collect garbage. I also enjoyed learning about eco-friendly green technology, renewable and eco-friendly materials and homes and about how Kitakyushu changed from a grey city to a green city. It made me realize how polluted cities can become green cities. It has given me hope when it came to looking back at my city and country's situation. I also admired how citizens' initiatives and citizens themselves worked together for the betterment of the city. "Enjoyed breathtaking beauty of Japan"
(Invitation) KAKEHASHI Project / High School Student from the U.S. The sheer beauty of Japan is beyond breath-taking and is not only found in the ever changing mountainous views but also in the kind hearts of the Japanese citizens. Never in my life have I met so many kind people in a single place. When I am surrounded by strangers I am incredibly uncomfortable but I’ve found that in the gregarious and humble country, that fear is alleviated. No matter where I’ve gone, be it a richly cultural town or a large industrial city, the Japanese people have treated me with the utmost respect and care. I hope to inspire more people to follow the example set here in Japan. "The Role of Japan in support of the challenges of Cambodia"
I would like to highlight three points that impressed me most during my visit to Cambodia. First, I was impressed with their hospitality extended to us Japanese. Second, I was positively influenced by their high motivation for learning and positive attitude for communicating with foreigners in English. Third, as I witnessed the actual situation in Cambodia with my own eyes, I realized the importance of the role of Japan to help improve the livelihood of people, traffic facilities, and sanitation & hygiene there. 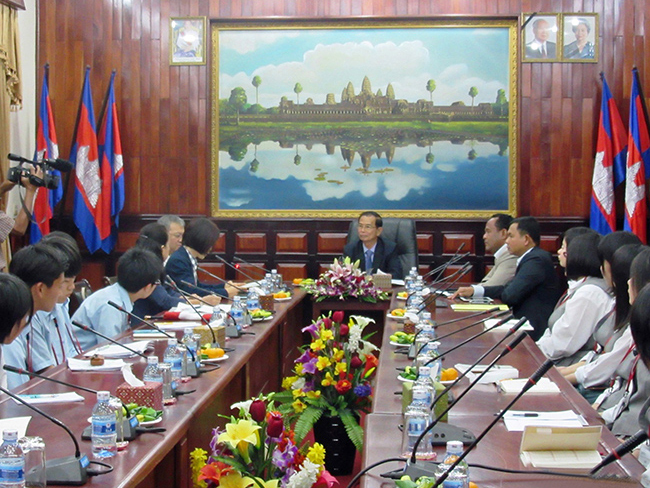 So I presented our action plan called "JAPABODIA" in order to continue further research into the challenges of Cambodia. The ten days I spent in Cambodia was such a life changing experience to me that it has made me feel positive on everything I do in study and future carrier. I thank all the people I met in Cambodia for this. "I want to see the joyous faces of the children"
Being able to interact with people who have a different culture, history, way of thinking and way of living from oneself is fun and also educational. Through direct contact, each other's countries and people feel closer and more familiar. International exchange becomes an opportunity to understand each other. If exchange with the other person's country broadens, then it can become the foundation for friendship between the peoples of those countries in the future. I always want to keep in mind our starting points: "I want to see the joyous faces of the children" and "Let's use this as a learning experience for ourselves as well"